While I’m out of town this week finalizing my Dad’s estate, please enjoy this contribution from my friend Jim Wang from Wallet Hacks. If you’d like to contribute to Frugal Rules, please contact us. When I was younger, I used to have four or five credit cards in my wallet to maximize credit card rewards. I knew which one to use at the gas station, which one to use at the supermarket, which one to link up to Amazon and which one was accepted at Costco. I was willing to deal with that complexity because I felt the rewards were worth it. I could also keep them all straight in my mind because I didn’t have as much complexity in my life. Fast-forward a few years and now that I have kids, other financial obligations and my memory isn’t as great anymore because it’s full of all this STUFF. When I was younger, I equated complexity with efficiency and effectiveness. Being optimal was the goal. As I’ve gotten older and demands on my time and energy have increased, I’ve learned that complexity isn’t always best. It may seem like I’m getting the best rewards but it comes at the cost of having to remember which cards to use in what situation, having to review credit card statements for fraud, and having to pay them on time even if I have auto pay set up. 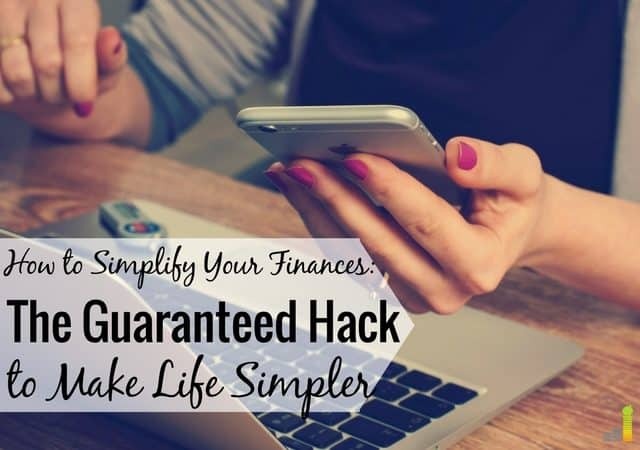 A few years ago I went on a mission to simplify my finances as much as possible. Instead of financial efficiency, which meant getting the maximum possible rewards, I opted for time efficiency. I now spend just 15 minutes a month managing my money and I willingly give up a few dollars of rewards for a simpler money system. There are two ways to simplifying your finances. I’ll share what I did and then an alternative that might work better for you. The core idea to simplifying your financial system is that simpler is easier to understand and remember. What’s easier than remembering? A picture. It speaks a thousand words! 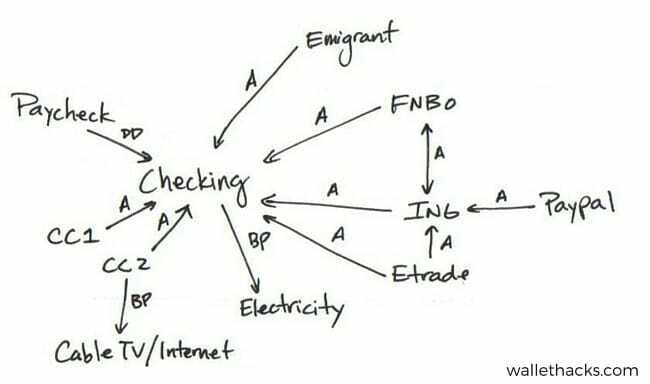 The first step is to draw a map of what your finances look like today, I call this a financial network map. Not the sexiest name but it describes what it is perfectly – a list of your financial accounts and how they are related. Once you’ve drawn this map, it’s time to start paring away redundant accounts. How many checking accounts do you need? How many credit cards? If two of them serve the same purpose, can you consolidate them? Your goal is to have as few accounts as possible without sacrificing the integrity of your money system. For quite a while, I had multiple online savings accounts. I opened them to review them and chase the highest interest rates. Over time, their interest rates all settled into the same tiny miserable range and I had a few hundred dollars here, a few hundred dollars there. It was not hard to transfer the remaining funds and call the bank to close them. Five or six bank accounts quickly became just one and I don’t lose anything. With credit cards, consolidation was a little trickier because there is a negative impact to closing a credit card. When I had two cards from the same issuer, I looked to consolidate balances into the older card. This reduced the number of credit cards but kept the oldest and maintained the same total credit limit. In the case of multiple issuers, I merely stuck the card in my drawer. It was out of sight, out of mind and off this map. This is just one approach to simplification. Another way is to draw your ideal financial system, with account labels rather than actual accounts, and then plug in your current accounts. The ones that are left over, as in not included in the map, are the ones you’ll close. Still another tool that can help you simplify your finances if this effort seems overwhelming is Personal Capital, a free online tool that makes it easier for you to track your expenses and manage your money. As someone who has taken the axe of de-cluttering to many aspects of my life, de-cluttering my finances was one of the best decisions I ever made. Every month, when I go to review my finances, I thank myself for having removed so much dead weight! 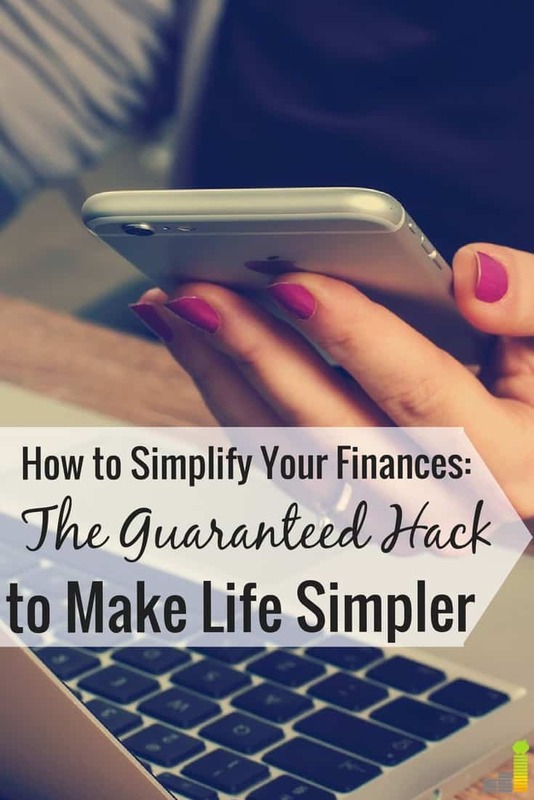 What’s one thing you’d like to simplify with your finances? Do you prefer to have many accounts spread out, or just a couple? How much time do you spend managing your finances each month? Jim Wang writes about unconventional strategies and tactics to get ahead financially and in life at Wallet Hacks. Join his free newsletter and see how he’s been able to put hundreds of dollars into some readers’ pockets with his advice. Ironcially, what has helped me simplify my finances is creating multiple checking accounts. I do this through Capital One 360. It makes me know exactly what I’m saving for and how much should be going into each account each month. We just closed several checking accounts for this very reason. We weren’t using any accounts at Fifth Third anymore, but we had money there. I decided to move it to our regular accounts and close the old ones for the sake of simplicity. I am ALL about having my finances simplified. The simpler the better. I’m amazed at people who manage to have endless amounts of cards and accounts. I’m in the process of simplifying my finances. I can’t seem to keep up with the credit card churning game like a lot of people. It seems more hassle than it’s worth and then I get stuck with annual fees because I’m not organized enough to keep track of them all. You really need to keep track of it with spreadsheets if you start applying for and getting a lot of cards, there’s no way to keep it in your brain. I don’t do it myself but the “pros” use spreadsheets. We consolidated all of our personal banking to our local credit union last year, and it does make things easier. It would probably make more sense to take my rarely used credit cards out of my wallet, but somehow that’s where they stay. I’d take them out only because if you ever lose it, it’s a PAIN to cancel them all… especially if you never use them. I’m hate systems that break, so I’ve tried to keep the finances super simple, and for anything spending/saving related, we’re there. The messy part of our lives is investing. It would make sense to streamline all accounts onto a single platform instead of across 4 platforms. However, deciding which platform is the best for us is a bear. Might as well draw names out of a hat. There has to be one where you would gain an advantage by having more assets? Or offers more flexibility or some benefit? I like having a bunch of accounts — but only through two banks. We have a ton of sub-accounts at Capital One 360, but that’s to help us keep track of various goals. It’s not about hunting down the best interest rate, just about getting a better one than what we have at our main bank. Then accounts at Chase for the day-to-day banking. I think the best thing we did to simplify our finances was to give up on traditional budgeting. Two people with multiple chronic health conditions means more co-pays/unexpected expenses/convenience food. It was too hard to predict. So we switched to a straight weekly spending amount. That took a ton of stress out of my life! Using various credit cards can complicate finances sometimes. We stick with our main Discover card. We do have another Discover card that I use for my work travel expenses or any BIG purchases. We are down to just three accounts (two personal and one business) now and it is so much easier to track everything. We have had as many as six in the past and that was kinda a nightmare to keep everything straight! There is definitely a lot to be said for making your finances simpler. Closed down personal accounts, I currently have 2 for my business. Husband has a personal account we use to pay bills and that’s it. We both have 2 debit cards (personal + business). I like keeping things simple when it comes to my checking and savings: just one account for each. But I’m all over the place when it comes to credit cards and it’s working fine for me so far. I’m a little more picky nowadays when it comes to rewards so I wait for really good deals. Even though it might make my life a little more complex for a few weeks, signing up for a credit card that gets me $500 in tax free money, for example, is surely worth it. Simplicity is great, but doing it just for the sake of simplicity when you can handle a little complexity is just leaving money on the table. And that’s no fun! I need to do this too. I used to chase high interests and opened multiple accounts as well as chasing sign up bonuses. I need to close some accounts. I still do carry multiple credit cards and try to optimize which one gives me the best cash back. It doesn’t take too much of my mental bandwidth since it’s already been ingrained in my head after all these years.